Coconut oil makes this dish tastes better so I used coconut oil in this recipe. However, you can use any refined oil. The CKP Garam masala is simple to make. Click here to know how to make it. 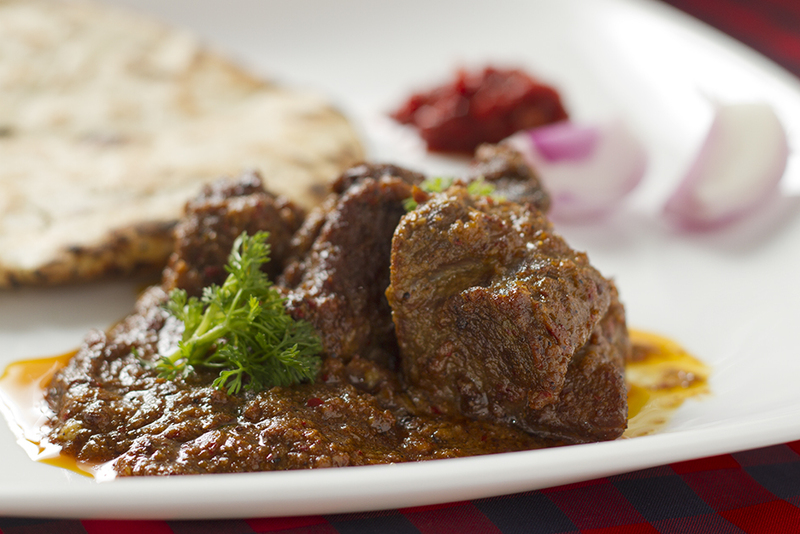 Malvani Sukha Mutton served with Bhakri, thecha and raw onions. Grind together dry desiccated coconut and dried red chillies and keep it aside. Marinate the mutton for 45 minutes with Turmeric, Asafoetida, Salt, Ginger paste and Garlic paste. In a pressure pan, heat oil, add bay leaf, 1 cinnamon stick, chopped onions and fry till onions get translucent. Add the mutton and fry on high heat for about 10 minutes so that its juices get sealed. Add about a cup of water and let the mutton simmer on slow gas mark for about 10 minutes after the first whistle. After 10 minutes, let the pressure drop and open the pressure pan. Put the pressure pan back on the stove. By this time the mutton is about 50% done. Add the coconut dried red chilly powder and 4-5 Tsp of CKP garam masala, stir the contents, let it simmer for about 2-3 minutes. Add 20ml or so of warm water and close the lid of the pressure pan. Cook it on pressure for another 15 minutes after the first whistle. After the pressure drops, open the pan, let the remaining water evaporate, stir the contents carefully without breaking the mutton pieces. Add 1 Tsp of garam masala, Taste for red chilli and salt content and add more if required. Garnish the dish with coriander. Serve with hot Bhakri, Thecha, raw onions and a glass of buttermilk. I made this and I followed your recipe except that I added fresh chilli paste instead of chilli paste and did not use pressure cooker. I left the mutton to marinate for 2hours. Thank you, glad it turned out well. can you use garam masala instead of ckp garam masala? would it change the taste too dramatically? Came out fantastic, thanks Swati!